Do vaccines cause autism? Are genetically modified crops safe to eat? Is organic farming better than conventional? Is race a scientifically valid concept? What is the future of biotechnology now that a synthetic cell has been created? If you’ve ever asked those questions, then you should check out Denialism, by Michael Specter. If you think you know the answer to any of those questions, then you need to read Denialism. In this book, Specter catalogs the myriad ways that irrational thinking even in the face of overwhelming scientific evidence can have a profound and negative effect on our lives. He begins with the example of Vioxx, the anti-inflammatory drug that was recalled due to a link with risk of heart-attack and stroke. Using this example, Specter seeks to explain the distrust that people harbor for science and technology, and especially corporations. He goes on to examine the well-known claim that vaccines cause autism. They don’t, and dozens of scientific studies can back that up, but more and more parents are opting not to vaccinate their children, placing entire populations at risk of diseases that until recently were thought of as all but eradicated. Specter does a good job describing the history of the antivax movement, and discussing the reasons for the movement’s existence. From vaccines, Specter goes on to tackle the growing obsession with “organic foods” and the irrational fear of genetically modified food. I found this chapter informative and also challenging. I live in Ithaca, where everywhere you go you can’t help but hearing about how organic and local and natural everything is. Heck, I have a farm share and get organic vegetables weekly all summer long from a local farm. Still, I have always had a healthy skepticism of the many claims about “organic” and “natural” products. Specter does a good job of debunking some myths about organic farming while also supporting other reasons that people choose to eat organic and local food. He also does a nice job with genetically modified organisms, although I wish he had spent more time on some of the counter-arguments such as Monsanto’s dubious ethics when it comes to selling seeds. Moving on from food, Specter continues with the theme of genetics in discussing how mapping the human genome is revealing how to treat patients with different genetics based on where their ancestors lived. This is a touchy subject, because we’re all taught that race has no basis in genetics, but as Specter points out, that’s obviously not entirely true. There are differences between people, and those differences are in the DNA. He discusses some interesting examples where treatment of patients needs to be varied due to slight differences in their genetics that make certain drugs more or less effective. The final chapter of the book deals with a topic that has been making a lot of headlines: artificial life. At the time the book was written, living things with a synthetic genome had not yet become a reality, but just a few weeks ago that changed. Specter talks with Craig Ventner about his work on synthetic life, as well as other biologists such as Drew Endy, who are working on figuring out the fundamental pieces of DNA to use as building blocks for entirely new organisms. This final chapter reads like the premise to any number of distopian or utopian science fiction stories, and I found it really fascinating to think that not far in the future new life forms could be assembled from scratch with DNA building blocks. In particular, the idea that organisms could be designed that need not be able to reproduce (because you could just make more in the lab) was an eye-opening idea to me. The whole last chapter has an interesting biology-as-computer analogy running through it, with the DNA as open-source software that anyone with the right know-how can meddle with. Overall, I enjoyed Denialism. My main complaint is that too often Specter appears to be too much of a cheerleader of scientific progress. I love progress as much as the next guy, but I wish Specter had spent more time on the many valid concerns regarding many of the topics in the book, especially in the last chapter. Maybe he did not address these because they tend to drift out of the realm of science and into ethics, but I finished the book skeptical of his optimism on some issues. I should be clear: this book will not be read by hard-line denialists. Specter shows quite a lot of (mostly justified) disdain throughout the book towards people who question science, and even though I often agree with him, I’m not sure he’s going to convert many people that way. But that does not mean the book fails in its mission. It is a really excellent reminder to those of us who like to think that we are science-minded that we need to be aware of denialism. It is not limited to uneducated people. Denialism is prevalent in highly-educated communities, such as college towns, where everyone loves their organic food and vitamin supplements. The book serves as a great reality check and also will continue to serve as a great reference for me any time I need to lay down the facts about things like vaccine safety or GMOs. 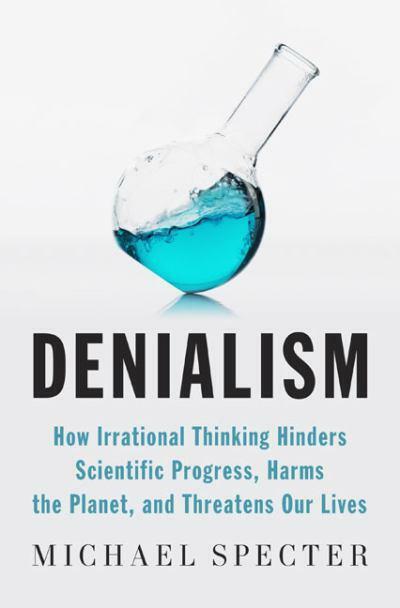 Overall I recommend the book Denialism. It may be preaching to the choir, but it also arms the choir with more knowledge to draw upon so that we can recognize denialism and do what we can to fight it. This entry was posted on June 12, 2010 at 2:13 pm and is filed under Uncategorized. You can subscribe via RSS 2.0 feed to this post's comments. Both comments and pings are currently closed. That sounds interesting… I’d be really interested to hear what he has to say about race vs. human difference and science. I mean, it’s undeniable that humans differ from one another (and that comes from our genes), but race is the social categorization of said difference. I think the debate arises when people try to separate “social” from “science,” when they really can’t be separated (especially in a field like medicine). When he says that “science is a process,” well, so is “the social,” and they’re intertwined. You can’t say that one exists inside or next to the other– a lot of our social concepts are based on various interpretations of scientific understanding, and science is also deeply influenced by social processes (like politics and economics). That’s how we end up with debates over GMOs and organic agriculture, and even racial difference in the first place. I wouldn’t call any of them purely “scientific” or purely “social” issues. I think you need both processes to get through them. Yeah, I think you’re right. The difficulty is that science and social processes never work alone. Race is a great example: there are clear genetic differences between groups of people, only a few of which are outwardly visible. The most medically important genetic differences are not the outwardly visible ones. For example, he talks about a study that found that Hispanics living in the northeast US were more likely suffer from ashtma than hispanics elsewhere. It turned out that puerto ricans are genetically more susceptible than mexicans to asthma. So the social category was not useful because it grouped Puerto Ricans and Mexicans into a single label “hispanic”, but there were significant genetic differences that changed the prevalence of pulmonary diseases.